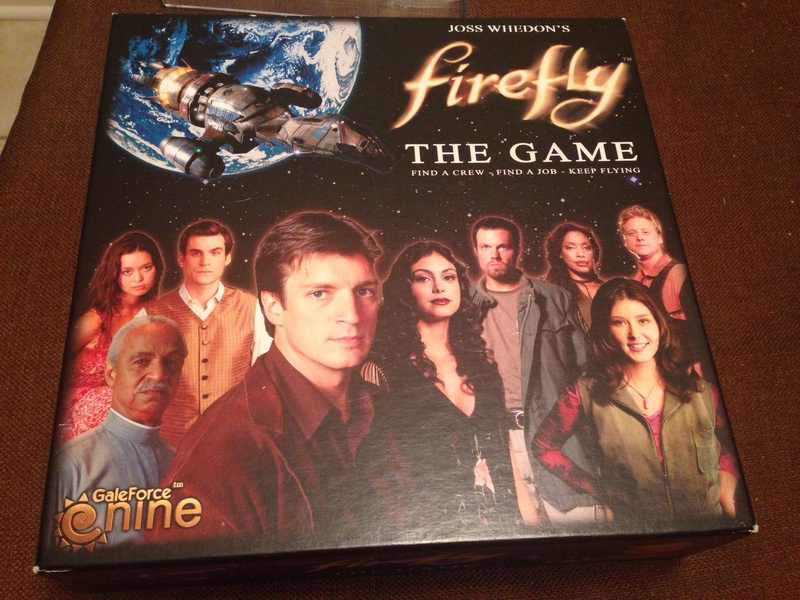 GaleForce Nine unveiled their new board game based off the cult classic and fatefully short-lived Joss Whedon TV show Firefly at Gen Con 2013. This game was certainly the belle of the ball–they sold out of all available copies they had set aside for each day of the con within minutes of the exhibitor floor opening and the lines to get in a demo game were always ridiculously long (I never was able to get in a game myself whilst at Gen Con). I finally had the chance to try this game out a few weeks ago at a regular board gaming meetup and instantly fell in love with it. Ok, now that we’re all on the same page I can continue. This game looks much more complex than it actually is. The thirteen individual decks might sounds a little confusing, but there are only four varieties of decks that have separate decks for different locations; the deck varieties are movement, supply, contact, and misbehave decks. There are two movement decks, one for moving inside Alliance space and one for moving around the border territories. There are five supply decks, one for each planet where you can purchases gear and crew members, and five contact decks, on for each contact from whom you can obtain jobs. Last but not least is the Misbehave deck which is used when attempting illegal jobs. 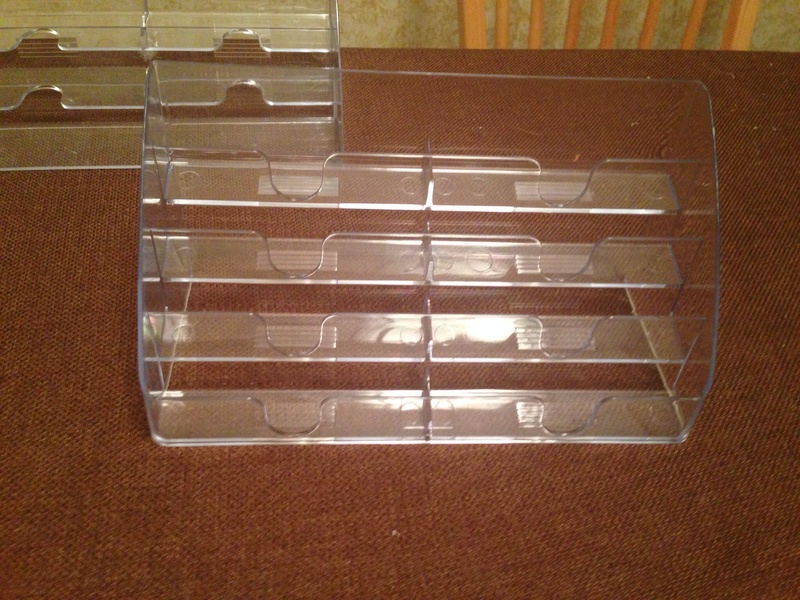 I picked up two business card caddies which each have eight card slots, these really help to keep the table area required for the game down and keep the decks and their discard piles organized. I plan on picking up another small business card holder to maintain the two decks that don’t fit into the holders I have. 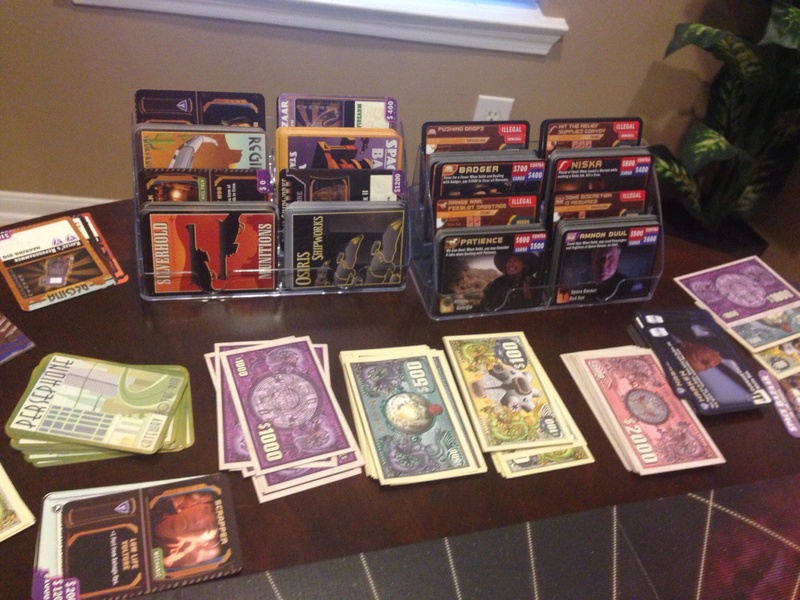 These holders work great for any board game that has several stacks of cards that need to remain separate (there are the perfect number of slots for Catan!). Everyone starts with an identical Firefly transport (yes, you can fly Serenity) and each player selects a captain (yes, you can be Malcolm Reynolds). You fly around the Verse dodging the Alliance and the Reavers, buying gear and ship upgrades, and recruiting crew members so that you can complete jobs you get from your five contacts (Harken, Badger, Patience, Niska, and Amnon Duul). Each job requires certain skills and skill tests to complete and your crew members bring different skills to the table (guns, wrenches, and talky bubbles). There are multiple scenarios with different win conditions, but most involve making a certain amount of money, completing enough jobs with specific contacts, doing certain scenario specific jobs, or any combination of these. 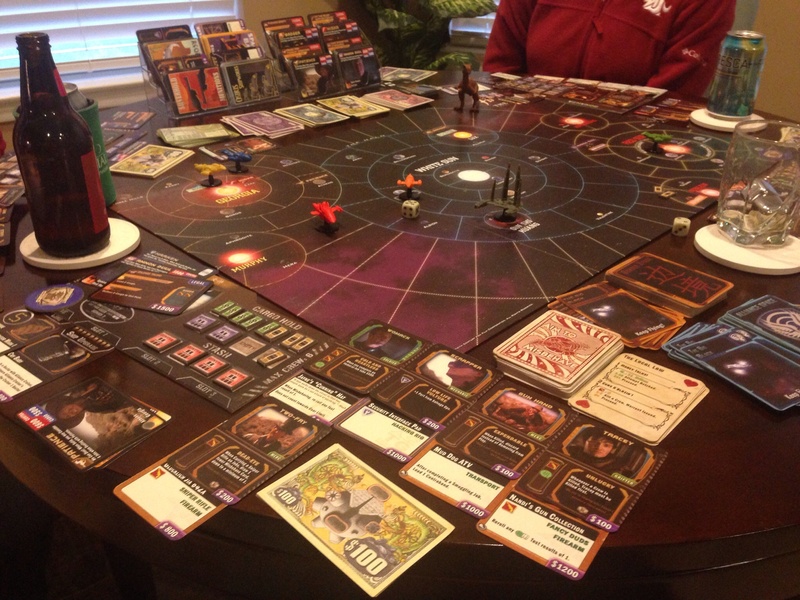 Firefly: The Game plays 1 to 4 players; I have yet to play any of the solo scenarios, but I have played with 2, 3, and 4 players and have to say that the game play works great for any of these player levels. It’s rare to find a game that plays as well at 2 players as it does at 3 or 4, but this game pulls it off better than most any game I have played. Having played a few games now I do have to say that the first time you play is going to take a while, but each time you play the game gets faster as the players understand the mechanics of the game and the options available to them better. Each scenario has an estimated play time on it (although all of them seem to be 2 hours) and I have managed to play a 3 player game with “experienced” players (we each had two or three games under our belts) within two hours. I haven’t had the opportunity to play all of the scenarios so far, but if any of those ever get dull (which I don’t see happening) it wouldn’t be terribly difficult to make up your own special scenarios. I have played other games based off of various other IPs and I have to say Firefly captures the feel of the TV show in board game form better than any other game I have previously played; most games have the IP they are based on shoehorned into clunky game play, but Firefly feels like you are part of the Verse. Playing this game makes me want to watch the TV show and watching the TV show makes me want to play this game (last time we played, we had the show on in the background and it was epic!). All of the other components of the game (game board, tokens, money, player pieces, etc.) are of very high quality; we kept commenting on how cool the money looked and how hefty the paper it was printed on actually is. All of the game cards are beautifully done with the aesthetics of the show and feature images taken directly from Firefly. Every single character in the game can be found somewhere in the show. The only downside of any component I can find is that the stegosaurus token used to denote whose turn it is is made from the same high quality cardboard as the rest of the tokens; in the rules they recommend picking up a plastic dinosaur to use because that’s more fun. I picked up a small plastic T. Rex (which certainly is more fun to use than the cardboard stego) for less than $3, but I had to find something to nitpick with this game and that is all I could find. Firefly: The Game is quickly becoming one of my all time favorites. While it is certainly not the fastest game to play, it is immersive and the game play flows very well. I give this game 5 out of 5 stars. A small addendum to this review: we did use the “Breaking Atmo” booster pack which adds some more gear, characters, and missions and I highly recommend picking it up if you pick up this game. There is also an expansion for Firefly coming at the start of May called “Pirates and Bounty Hunters” which will add some optional player v. player combat and more ships to play with. 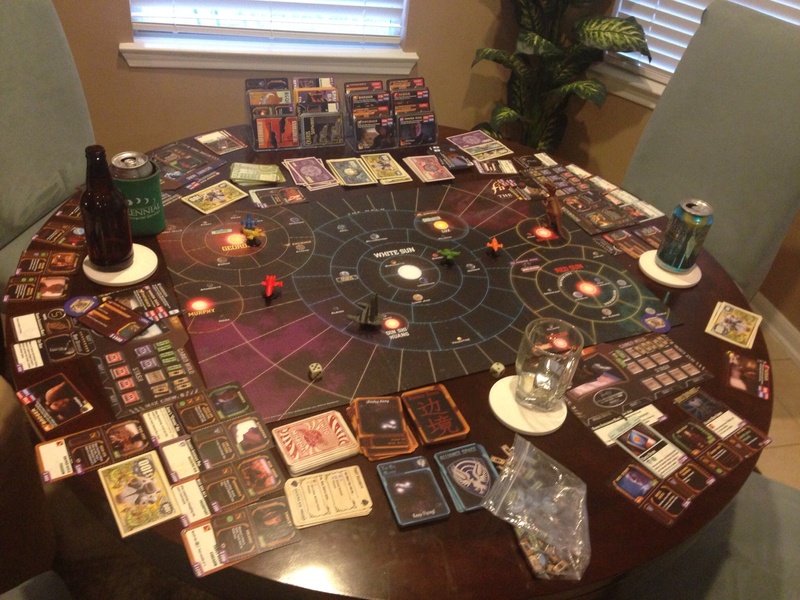 Update 3/23/15: I posted a review to the Pirates & Bounty Hunters Expansion for Firefly: The Game. Check it out here!